These images show views of Earth and the moon from NASA’s Cassini (left) and MESSENGER spacecraft (right) from July 19, 2013. In the Cassini image, the wide-angle camera has captured Saturn’s rings and our planet Earth and its moon in the same frame. 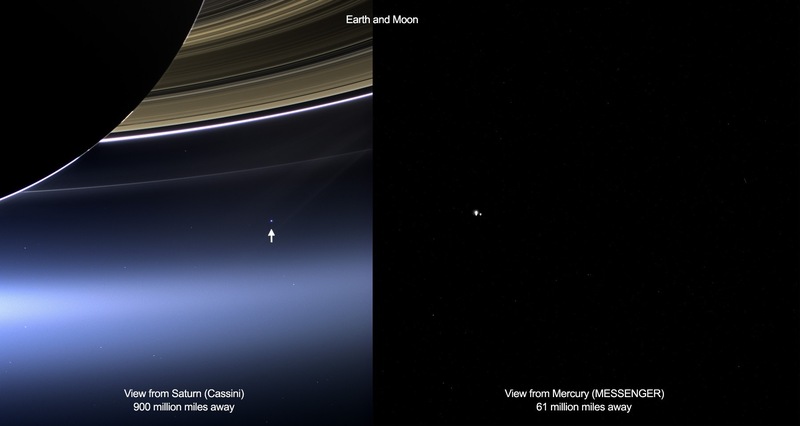 Earth, which is 898 million miles (1.44 billion kilometers) away in this image, appears as a blue dot at center right; the moon can be seen as a fainter protrusion off its right side. An arrow indicates their location in the annotated version. The other bright dots nearby are stars. In the MESSENGER image, Earth and the moon appear as a pair of bright star-like features. MESSENGER was at a distance of 61 million miles (98 million kilometers) from Earth when it took this image with the wide-angle camera of the Mercury Dual Imaging System. MESSENGER took this image as part of a campaign to search for natural satellites of Mercury. Earth and the moon appear very large in this picture because they are overexposed. When looking for potentially dim satellites, long exposures are required to capture as much light as possible. Consequently, bright objects in the field of view become saturated and appear artificially large. In fact, Earth and the moon are each less than a pixel in size, and no details on either can be seen. This entry was posted in Uncategorized and tagged astrophoto, Cassini, Earth, JPL, Mercury, MESSENGER, Moon, NASA, Saturn, space image. Bookmark the permalink.